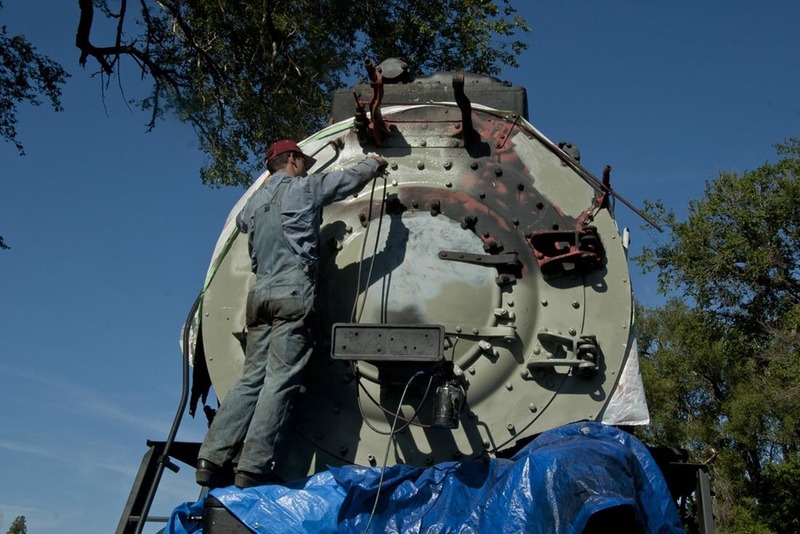 In May 2012, a crew of CSR volunteers headed to Topeka to cosmetically stabilize the locomotive. It was crucial to CSR that further corrosion of the locomotive be halted and that the engine be put back into attractive cosmetic shape so that it could serve again as an asset to the community of Topeka prior to its move to the Twin Cities for reconstruction. The first course of action for the volunteers was to clean up the enclosure of the many piles of junk wood, steel pieces and debris. Many pieces of piping, nuts and bolts were found strewn across the ground. They were picked up, placed into buckets and moved to a secure storage location. Once the site was clean and grass mowed, the crew went about preparing the locomotive for painting. This included wire wheeling and needle scaling loose rust from the wheels, cab, sand dome and lead / trailing trucks. After loose rust was removed, the entire locomotive was power washed twice. CSR was able to secure donation of twelve gallons of sustainable, industrial, rust-abating paint from Forest Paint Company, ten gallons of black, one gallon of grey and one gallon of safety red. With a spray gun in hand, the very first pass of paint went on to the fireman’s side of the trailing truck, and it was an inspirational sight to see! 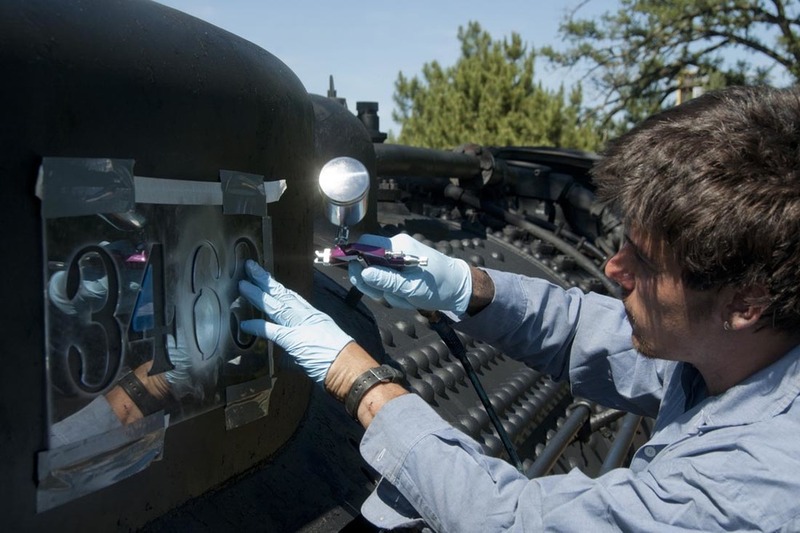 The crew made efficient work of painting the locomotive black. Once the main coat of black was done, work transitioned to painting the smokebox front gray. Detail painting work was led by Warren Scholl, who insisted repeatedly that, although the locomotive was delivered to the ATSF with white tires on all of the wheels, the railroad promptly painted them black. The crew relented, and the engine was returned to as-operated cosmetic appearance. Final touches included stenciling “AT&SF” and “3463” on the locomotive using laser-cut custom stencils and a detail airbrush. The finished piece was an incredible transformation. All told, the CSR crew spent a week on-site, moved tens-of-thousands of pounds of materials into secure storage, cleaned and painted the 50-foot-long locomotive and transformed the engine 3463 into an attractive, cultural asset.